40 connections. Different era and arenas. A short time ago. Asked to come up with 3 distinctive, positive characteristics Øivind Lunde. The results are summarized in Term Cloud. Øivind Lunde is triggered by entering into situations where others have given up. He has also been in conflict situations both inside and outside the courtroom. 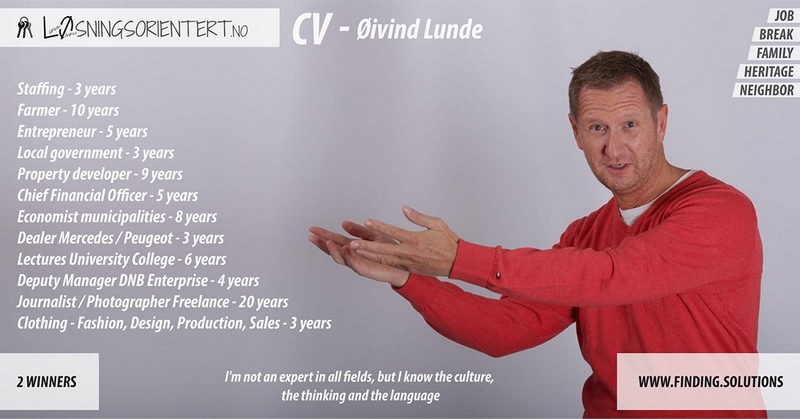 He has broad experience and extensive CV. Øivind Lunde is an economist of education and has been a finance manager in municipalities and businesses, head of business in DnB, driven farms, car dealer Mercedes / Peugeot, construction company, retail / manufacturing / branding, car import, freelance journalist / photographer, agency, housing and property development. Most here at home, but also across national borders. It is the experience from this, as well as the experiences of various board work in companies, teams and associations that form the basis of Løsningsorientert.no. If there is a problem then there is a solution! Nobody is served by cultivating a conflict. Everyone is served to get it fixed. LØ has conflict resolution as its arena. LØ gets the parties out of conflict-focused trenches and into solution-oriented thought patterns. LØsningsorientert.no Finds the key where the situation is locked. Solution-oriented in a way that gives all parties the feeling of winning.